The members, soon pushing 60, gathered for an unannounced informal concert for family and friends last summer in Trondheim. Around 400 showed up. Now, they wanted to play one last real gig in their home town and tried to gather as many members of the band as possible. 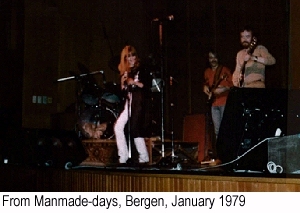 During the 1970s, people came and went apart from Asle Nilsen (bass, and occasional flute in the early days) and Kjell Larsen (guitar). 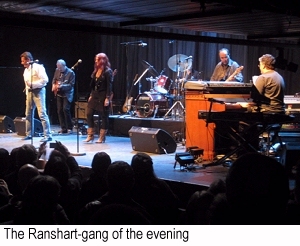 All members that participated on the albums were present at Rockefeller, apart from Rune Østdahl lead vocalist on Ranshart, who live in Spain and couldn't be traced down. Also Thor Bendiksen, drummer on all albums apart from the last one, is so troubled with tinnitus (ear problems) that he couldn't join the others on stage. Instead Bjørn Jenssen handled the drums all evening. The gig started in a fairly relaxed way with "Corner", a nice instrumental from Let Your Light Shine, by the quartet Nilsen, Larsen, Jenssen and original keyboardist Håkon Graf, that had flown in from California for the occasion. Enter Gudny Aspaas for the signature tune "Sha Ba Wah" off the same album, a demanding song in the higher register for the vocalist. She stood the test without problems. Her voice sounded as if she had sung these kind of songs on a daily basis for the last thirtysomething years. Then they introduced Hans Petter Danielsen (guitar) for a couple of songs and Rune Sundby (vocals and acoustic guitar). 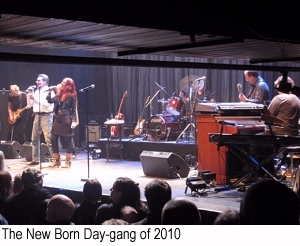 The seven on stage went back in time to a New Born Day. Several songs off that album and Ranshart and the single track "Flying Dutchman Fantasy" in between, exemplary presented though Rune excused some outdated lyrics of "Scientific Ways" (or was it "Day After Tomorrow"?). It seems the band particularly enjoyed playing these songs. The vocals of the songs from Ranshart were handled without any problems by Gudny and Rune. For me the highlight of the evening was "Love Is My Light" and "Back Side" off the latter despite a little bit of technical problems. Two nice little gems with progressive tendencies, great guitar and keyboards parts. Håkon Graf busy behind his Hammond organ was a worth the price of the ticket alone. I have never quite understood the criticism that Ranshart sounds too much like Yes of the early 1970s, even less so performed live in 2010. We even got a rearranged song from Manmade by this gang ("Dear Friend" was it?). Then back to some songs from the first half of the 1970s, with a hard rockin' "Coloured Dreams" as the obvious encore performed by at least eight of the ten musicians of the evening. I first saw Ruphus live in January 1979. They sounded at least as fresh and motivated 31 years and one month on, although they had nothing really new to offer apart from the altering and expanded line-ups of the evening. Rumours say there'll be a live album and maybe also a DVD from this - probably - unique gig. 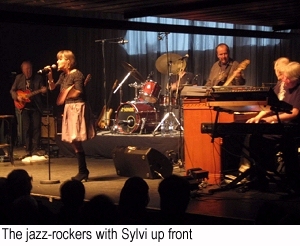 You may also want to check out our Ruphus article/review: Rock på Torget - Bodø, August 14th 2010.